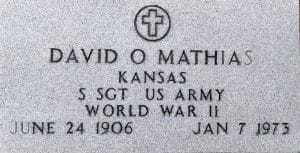 David Orville Mathias, known as “Matty”, came to Hutchinson, Kansas, in March 1934 to play professional baseball for the Hutchinson Larks. Born in Merom, Indiana, June 24, 1906, he was stretching it to play with the ball team which had an age limit of 26. The Hutchinson Larks existed from 1934 through 1938 (when it became the Hutchinson Pirates through 1942). It was in the Western Association of class C teams. The Larks became a St. Louis Cardinals affiliated team 1935 through 1938. 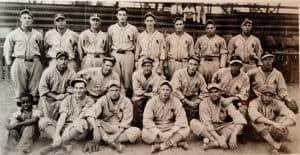 Facing the 1934 Hutchinson Larks in the Western Association were the following teams: Bartlesville Redwings, Joplin Miners, Muskogee Tigers, Ponca City Angels, and the Springfield Cardinals. The Hutch ball games were held at Carey Park “under the lights” as night-time baseball became popular. Single games started at 8:30 p.m. Price of admission was sometimes advertised as 25 cents for ladies and 40 cents for men, other times as “25 cents Everybody”, although booster nights allowed fans to watch the game for free if they had acquired a ticket from a local business. Cold beer was available for purchase by adults who wanted to cool off and relax in the summer heat. It was a brief diversion from the region’s dust storms and the country’s Great Depression. Children, including my father who was 14 years old, would chase foul balls and home runs. They would either return the ball to a team representative for a small reward or keep the ball for their own ball practice. Many youngsters dreamed of becoming a big-league star like Lou Gehrig, Carl Hubbell, or Jerome “Dizzy” Dean. 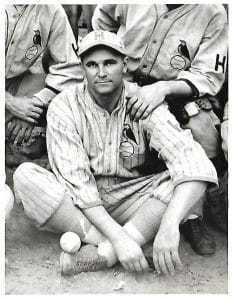 In 1934 the Hutchinson Larks, managed by Boyce Morrow, finished in fourth place with a record of 66 wins and 68 losses. Mathias, a “big right-handed” pitcher accumulated a season record of 15 wins and 12 losses, and an ERA of 4.47. He performed in front of many of the 43,941 fans who attended the home games. After one season on the team, Mathias played ’35 in Omaha and part of ’36 in Houston. 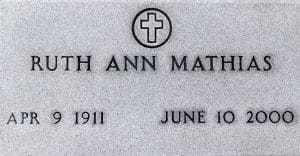 Matty and Ruth McFadon married April 25, 1936. They had met in 1934 when Matty came to Hutchinson and became one of the ballplayers renting space at the McFadon boarding house. After making Hutchinson his home in ’34, Mathias worked the off-season and later year-round for service stations in Hutchinson. In the course of Matty’s workday he occasionally learned news helpful to local law enforcement. When he had information to share, he called the sheriff’s department. 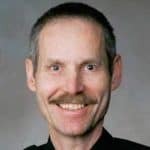 It was while he was a service station manager at C. W. Kelly at 30th and Main that Reno County Sheriff Guy Ankerholz drove up to the station and invited Mathias to work for the department. This was 1940-41. On December 15, 1942, Mathias was drafted by the US Army. 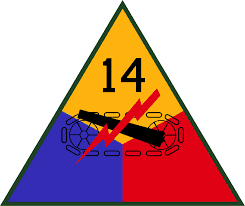 In the European Theater, he served in the 47th Tank Battalion, 14th Armored Division with Patton’s Third Army and also in the Seventh Army. Mathias became a staff sergeant and tank commander. He was shipped overseas in October 1944 to Marseilles, France. In March 1945, along the Rhine River in France, he was severally injured by shrapnel which lodged in his back. Mathias received medical attention at a hospital in Verdun, France, before being shipped back to the States. He continued receiving care at Okmulgee, Oklahoma, and Brighman City, Utah, before his final return home to Hutchinson in December 1945, having earned a Bronze Star Medal and Purple Heart decoration. Mathias rejoined the Reno County Sheriff’s Office about 1950. He served as undersheriff to Victor H. Frazey and then in the same capacity under Sheriff Roy Sheppard. He ran for sheriff unsuccessfully in 1954 and 1958. 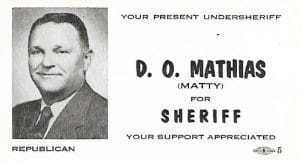 After losing to Calvin Sheppard in the Republican primary for sheriff in August 1958, Mathias resigned. He then worked maintenance at Dillon’s Lake and followed that job as a warehouse watchman for Dillon’s. Ruth Ann was a lifetime Hutchinson resident. She worked as a bookkeeper and receptionist for Dufek Oil Service Company, and was a bookkeeper for the Hutchinson Welfare Office where she was working when she retired. Matty died in 1973 at age 66. His wife, Ruth Ann, joined him at Eastside Cemetery, Hutchinson, in 2000. They had no children. This is an expanded version of an article I wrote and published in 1986 for the “Good News Blues,” a Reno County Sheriff Department newsletter. 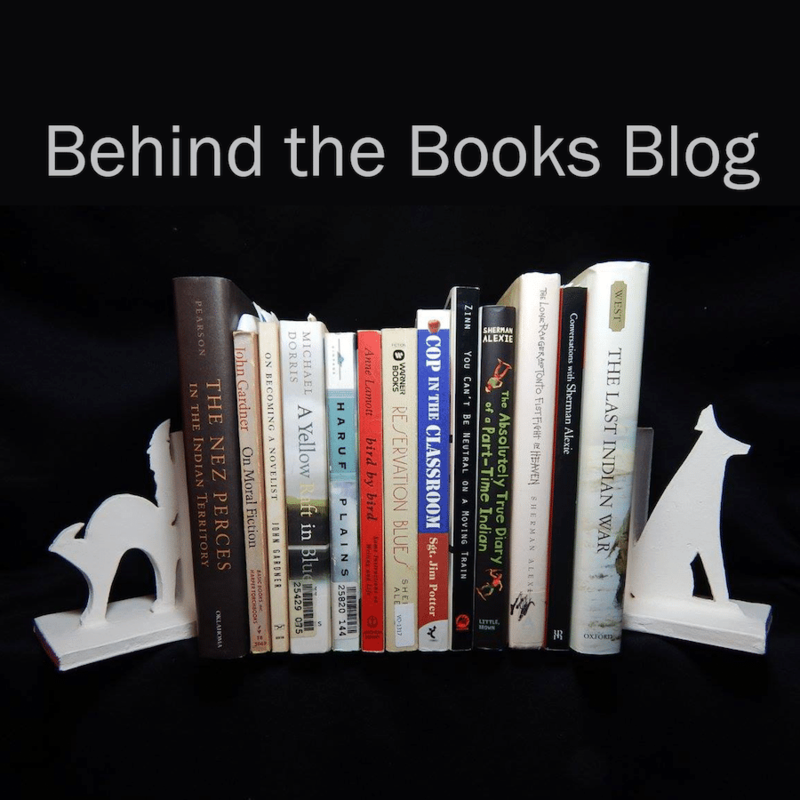 PS–please do share your blogs with the local history and library archives! This is important city history! This is a colorful piece of history. So glad you shared it. Thanks for your comment. Looking back, baseball was real entertainment during the Depression and before TV. Of course, World War II was such a huge part of everyone’s life, that it’s impossible to imagine if you didn’t live through it. I really liked the story about Matty. Playing minor league baseball was and still is a tough row to hoe but it sounds like Matty enjoyed it. We all tend to forget the sacrifice that was made by many during WW2 (the “big one” as my mom, who served in the Navy, always called it). I like how you’ve given us a full picture of his life. Jim, I love history and I love baseball, which means I really enjoyed this blog. My father played baseball at Knox College in Illinois and attended his first Cubs game in 1918 at age 16. Years later my siblings and I accompanied him to many Cubs games, taking the famous “L” from Wilmette which stopped at a station just a block or two from Wrigley Park. He knew the Wrigley family so he could get tickets if a particular game was a popular one with the decent seats already taken. I don’t know if he ever took advantage of their friendship, though, because he wasn’t someone who typically asked favors of people. Sean, Thank you for your comment and question. Yes, I did speak with his wife back in 1986. Your question has led me to decide to add a little more to this story. I’ll edit and re-record the audio. Ruth reminded me how tough things were during the Great Depression. She said that jobs were nearly impossible to find and if you had one it wasn’t any income. 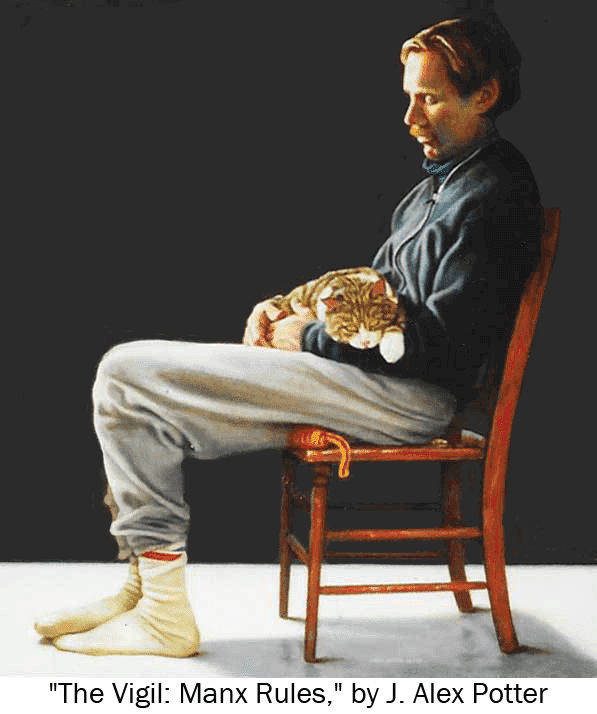 Fabulous story about a fabulous life. Thanks, Rock. You know this better than me, in our writing we’re always looking for and finding characters. I expect a little bit of Matty will show up in one of my characters in the near future.